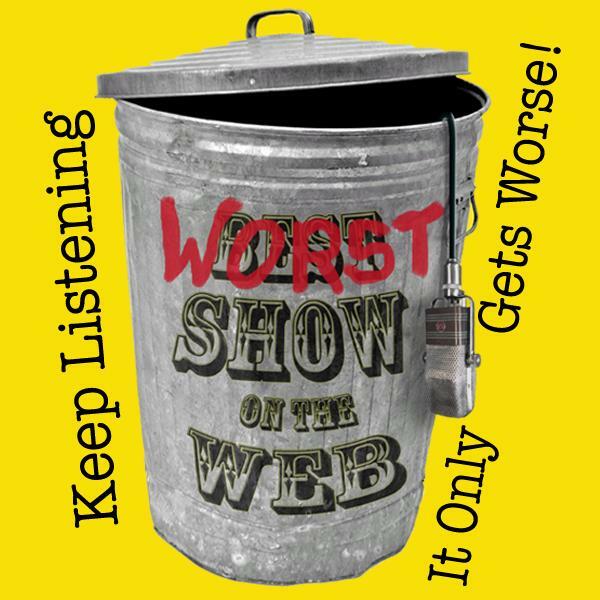 Welcome to the BTR site for the archives of "The Worst Show on the Web." We have moved our show to video! We are now doing a live video broadcast on TradioV - radio in TV! We invite you to join us LIVE each Monday evening at 9pm Pacific / 12am Eastern for an hour livestream of mindless banter and witty drivel that you won't find anywhere else - NOW in COLOR! You can also check out our website at www.worstshowontheweb.com or our Facebook Page - www.facebook.com/TheWorstShowontheweb - where you can sort through the various and sundry blog entries by our hosts and correspondents. You'll find more mindless blatherings on any and every subject - from film and TV to food and technology. If you think our show is bad... keep WATCHING, it only gets worse! 03/31/14 - "The Double-Header Episode with Matt Corboy and Clint Smith!" What do we do when two of the three co-hosts of the Worst Show on the Web are busy with other projects? Do we cancel the show? Do we schedule a rerun? Heck no, we just book MORE guests! This week we have something special. With Anthony and Wes away, we have invited actor Matt Corboy (The Descendents) to sit in and act as co-host. THEN we will be talking to educator, spoken work artist, activist and TED presenter Clint Smith. Mr. Smith is teaches English at Parkdale High School in Prince George's County, MD. He was also profiled as one of the top 50 educators in the nation in the 2013 book "American Teacher: Heroes in the Classroom." Mr. Smith will be sharing with us his views on education and where he thinks are our strengths and weaknesses. Bringing you the worst in interviews with people who are way smarter than we are via podcast... guaranteed! 03/24/14 -"The Bob Clendenin Episode!" 03/17/14 - "The Lost Episode!" 03/10/14 – “The Broadway Brothers Episode” Redux! 03/03/14 - "The Oscar/Razzie/Indie Spirit Awards Recap Episode"
02/24/14 - "The All Hail The Geeks Episode!" 02/17/14 - "The 3rd Indie Film Cred Episode (this time w/Jack Perez)!" 02/10/14 - "The 2nd Indie Film Cred Episode (this time w/James O'Brien)!" 01/27/14 - "The Dee Wallace Episode!"